This week, I am visiting family in Florida for the holidays. We are in Naples, where the news recently reported that there was a “meteotsunami” on the beach. Of course, the words were latched onto by the news organizations to create fear and horror on the part of the viewers. Who from out of town could read this and not conclude that the world is unsafe - disaster could unfold at any moment even on the usually peaceful Gulf coast of Florida in December! What was the truth? The tide rose quickly - more than a foot of sea level rise in the matter of a few moments. Clearly not a disaster, and no one was injured - perhaps causing the loss of a beach chair or floaty. What the news reports do not tell you is the aftermath! The beach is now itself 2 feet higher - beautiful white sand delivered by the surge. In addition, walking along the beach, we discovered that the ocean delivered to us a bounty of shells. This beach often gifts us with beautiful shells, but this is unprecedented. Even now with the beach crowded with New Year’s visitors, there are mounds and mounds of amazing shells. 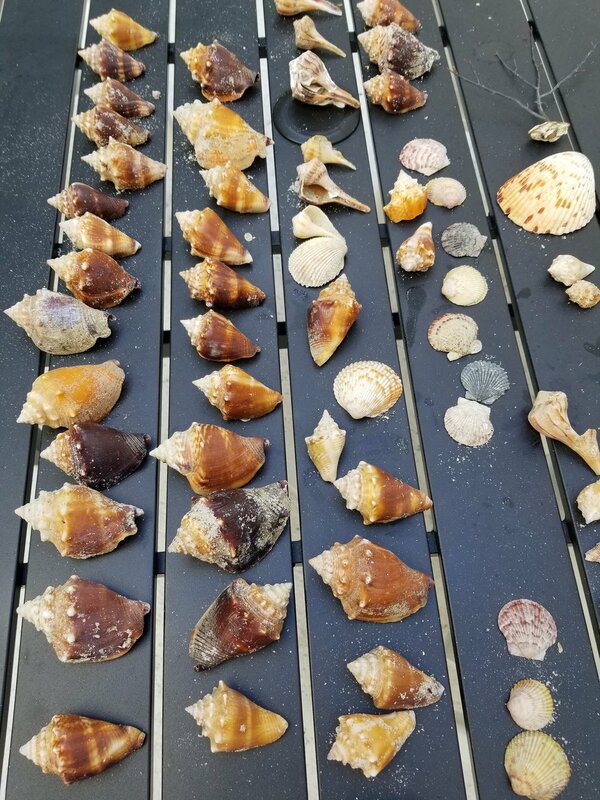 Mostly conchs, but also whelks, and other lovely shell varieties. A bounty of gifts given by the storm. And, before you panic that these shells represent a giant death of sealife, these are all shells without an inhabitant. Once again this illuminates how a simple mind shift can allow you to control that world of your mind. Do you allow yourself to be swept in a tide of fear and pessimism or do you focus on the bounty around you every day? You don’t have to be here in Florida to open your eyes to abundance. Birds singing, the stark beauty of leafless trees illuminated by low light, the magic of a snowfall creating diamonds of light after a storm - no matter where you are, there are gifts everywhere. I invite you to resolve to shift your mindset. In 2019 will you see abundance or will you see lack? It is up to you! If you would like to participate in this January's course exploring abundance, click here for more information!